Fortunately, after completing my master’s course, I got the opportunity to visit Saitama University as an exchange student to learn about “Genome Profiling (GP) technology” under the kind supervision of Prof. Koichi Nishigaki, who is the pioneer of this technology. I was profoundly fascinated with the GP technology and wanted to learn more about it and therefore, I decided to return back to Japan. Another important and fortunate aspect for my research at Saitama University consisted in the fact that I was able to seek advice from Prof. Koichi Nishigaki, who is the trailblazer in this area. Upon returning to India after getting short training in Japan, I was awarded a scholarship by the Japanese Ministry of Education, and so I was able to get enrollment to pursue my PhD. My current research is on detection of genome sequence alteration among cell in a single organism using GP technology. I believe that this research will certainly contribute in revealing the peculiar mechanism(s) of cancer progression and other cardinal aspects such as species classification and identification, to obtain far more realistic and reliable understandings. 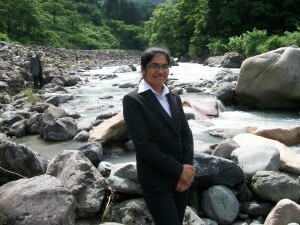 am most definite that my experience and studies at Saitama will shape my future role in society. Personally, I am honored to be grouped along with Prof. Nishigaki laboratory.